1Department of Chemistry and Biochemistry, Chaudhary Charan Singh Haryana Agricultural University, Hisar, Haryana, INDIA. 2Biochemistry and Nanosciences Discipline, Defence Food Research Laboratory, Mysore, Karnataka, INDIA. 3Department of Molecular Biology and Biotechnology, Maharana Pratap University of Agriculture and Technology, Udaipur, Rajasthan, INDIA. Background: Herbs have long been the basis of medical treatment but the practice of herbalism is not strictly based on evidences gathered using scientific methods. Ashwagandha (Withania somnifera L.) is a traditional medicinal herb used in the treatment of various ailments. 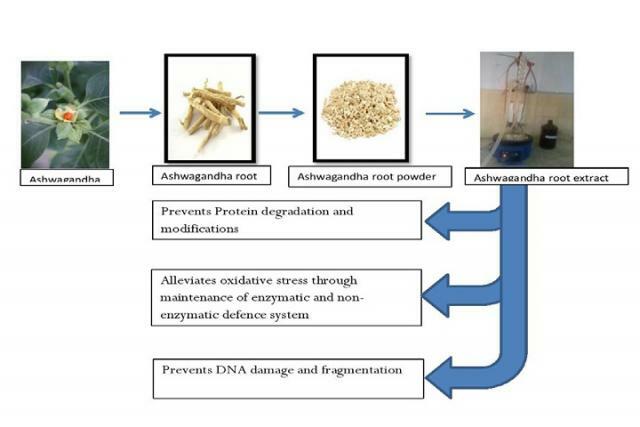 Objective: In current study we have evaluated the acetylcholine esterase (AChE) inhibitory and antioxidant potential of Ashwagandha root extract (ARE) in in-vitro and ex-vivo models to give a scientific base to its use in herbal medicine. Methodology: Simplest extraction e.g. maceration method was performed for preparation of extracts using methanol as solvent. Both in vitro and in vivo experimental trial were executed to evaluate the efficacy of root extract. Result and Discussion: ARE substantially scavenged free radicals and effectively prevented protein degradation as well as modification as studied by SDS-PAGE and Western blotting. Pre-treatment with ARE protected rat lymphocytes against H2O2-induced oxidative damage. H2O2 treatment resulted in DNA fragmentation and significantly decreased the activities of key antioxidant enzymes namely superoxide dismutase, catalase, glutathione peroxidase, glutathione reductase, glucose-6-phosphate dehydrogenase while decreased and increased the content of glutathione and malondialdehyde, respectively. ARE pre-treatment almost reversed these changes indicating its efficiency to suppress hydrogen peroxide-induced oxidative stress. Conclusion: The study provides the scientific basis of pleiotropic functions of Ashwagandha. Pal A, Kumar KH, Bhushan B, Saharan V. Ashwagandha Root Extract Inhibits Acetylcholine Esterase, Protein Modification and Ameliorates H2O2-Induced Oxidative Stress in Rat Lymphocytes. Pharmacognosy Journal. 2017;9(3):302-309.